Our club had a tour last weekend and a relatively new T driver had a problem that we are trying to solve. There was an extremely steep downhill section of a road. He went down the hill in Ruckstell low to avoid braking problems. After stopping a few times about 10 miles later the car would not turn over to start, appearing to be in gear. The car began to stall reaching stop signs apparently because of no neutral. After a push start the truck would run fine in high but would stall at each stop requiring a push start again. Once back at the motel, there was a neutral, but there was a chirping sound and a slight movement forward with each chirp. Today, the truck was unloaded. The chirping was still there and the noise got louder when the low pedal was pushed. Then, within 3 minutes, the noise quit and the truck decided it was time to act right. No chirping, no movement, and a good free neutral. I drove it several miles with no issues. The question is- what would cause this condition, and where do we start looking? You will likely find he had a seized triple gear bushing. With luck it has freed up for good. Or may seize again. Or not. Or has now spun in the gear. has engine/transmission been gone through recently? Going down a hill in high transmission is direct, the triple gears would not be doing anything. Not saying that's not what the noise is, just don't see how the hill would have anything to do with it. The oil could go forward and cause transmission components to dry out...bearings/bushings etc. I would at least look inside the inspection cover and change the oil in a strainer to look for debris. He said Ruckstel low, so assumed he had it in Ford low as well. You are correct though that if in ford hi at the time, gears would not be in the drive line. I'll bet he was in ford low, too, though if he was a new driver faced with a steep hill. Mine in low/low will only go about 6 mph, it would have to be a pretty scary big hill for me to push the pedal in. It may be time for a thorough transmission/driveline inspection because I doubt it cured itself. Better to fix it now than run the risk of catastrophic damage. Dave and Scott- The transmission has was recently balanced with new bushings installed to .002"on each side of the pin. Again, I will explain that the truck was going down a very steep hill in Ruckstell low, which would mean that the low pedal was firmly to the floor. You should be able to see the gears through the cover enough to check for damage. Yeah, Bill, he heated up the triple gear bushings. If they're free now, low works fine, and there is no chirping, there is a possibility that this may never happen again. That was a very extreme condition where they got starved for oil on a fresh rebuild. I'd open the transmission door and see that all 3 will slide back/forth on the pins. If they do, there is nothing to be gained by disassembly at this point. And finally, thinking about it some more, an even tighter place that could have gotten starved for oil would be the output shaft bushing. Had a friend with an estate-sale purchase have one seize up pretty quickly. There was nothing right about that transmission and every bushing was out of line and tight. I am not implying there was anything wrong with Bill's friends assembly...just that this bushing get's it's lubrication through a very tortured path and could conceivably been run dry under this condition. Still, if there is no binding or noise, disassembly is not guaranteed to point to any problem. Could be teething problems on a fresh rebuild under difficult circumstances. I am not trying to be contradictory and maybe I don't fully understand the transmission, but it seems to me that if the handbrake is pulled back and the e-brake is applied, which would mean the trans is in neutral, then the triple gears would not be activated and the gears spinning. Had it happen before, drive plate bush. Bill, the triple gears do turn in neutral. Bill, you're correct on the park brake and neutral not working the gears. But you said the "low pedal was firmly to the floor", definitely engaging the triple gears. Yes Frank, to clarify, spinning but not under a load. Thanks Frank. It was the drive plate bush I was speaking of. Wrong nomenclature on my end. That's the one bush I could think of that met all the various criteria for seizing or chirping, as I understood Bill's description. Dave- the driver had his "low pedal was firmly to the floor" while coming down the hill. When he came to a stop. the engine had no neutral, it would stall when stopping. He drove back in Ford high. After the truck sat a while, there was a neutral. That is when I heard the chirping. There was a neutral at that time, but it chirped and moved. When the low pedal was pushed the chirping got louder, but we were able to drive it onto the trailer. I just now found out the chirping was not present during his drive back to the motel. The chirping started after an hour cool down and re-start. Does that indicate that the seized (whatever) may have freed up a bit while it sat? After sitting overnight, everything got free and it now acts right. It is possible you now have a 50% chance that it's as it should be or 50% chance that a bush is now frozen on and is spinning on the out side. I'm going with the "bushing spun in the gear" camp !!! I've taken dozens of transmissions apart and nearly all had at least one if not two bushings stuck to the pins and spinning inside the triple gear. If stuck bushings are so common, do they actually present a problem? Just wondering.. 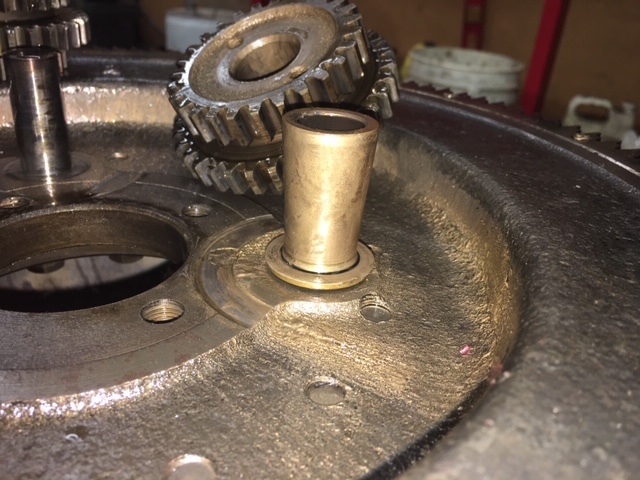 I suspect the ID of the triple gear is not machined to the same finish as the pin, since it was only designed to have a bushing pressed into it, not be a running surface. As such, i would expect it to wear the OD of the bushing if the bushing is stuck to the pin and the gear is rotating on the bushing. I had a car with malfunctioning mag that had the quietest, nicest transmission ever. Tore it down to fix mag and found 2 of 3 bushings spinning on both the gear and the pin. Don't know how long it was like that nor how long it would have lasted, but is sure was a sweet transmission. Interestingly, had almost correct clearance (slight O/S) on pin and very close fit to the gear (gear ID was clearly O/S, though). The transmission was taken apart for inspection a couple months ago because of a triple gear that had excessive "rattle" when wiggled. See Photo. For what it's worth, the engine/trans were rebuilt professionally 18 years ago. A year into the rebuild a wiggle was found, notified the rebuilder, and got the "It's OK" reply. During the years there was never any indication of a problem or noise. The distortion in the photo is not fake. There was a major taper worn into the bushing. So based on the replies today, the truck will be driven until the next time it hits the engine stand, then there will be a thorough inspection. There are 3 oil lines that deliver oil to the front for security while CLIMBING hills. One is a high-flow. I guess extra oil lines have the opposite while descending. you're correct about gear ID finish as new. 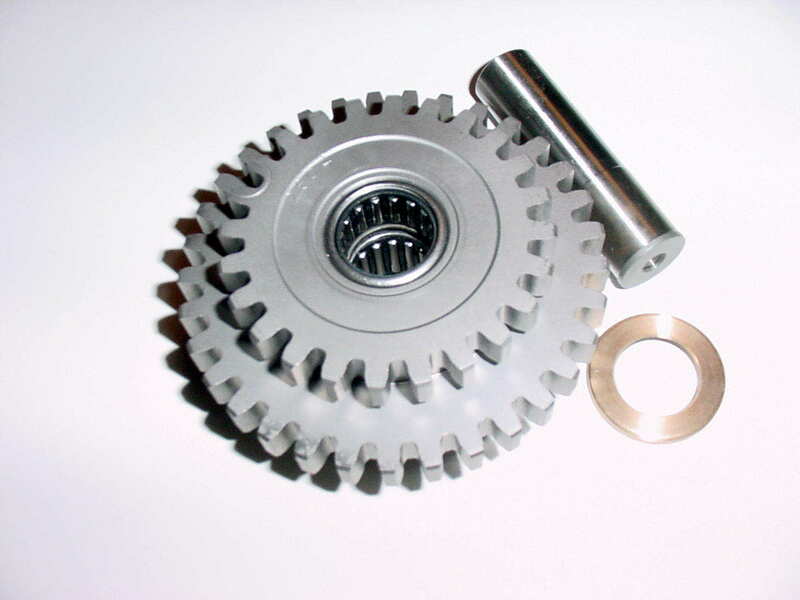 Interestingly, on my spun gears, the gear ID was like glass and perfectly round. I think dirty oil combined with bronze being an excellent lapping plate, the bronze smoothed the gear to a very high finish and not quite .001" clearance (yep, less than a thou). New bushings from Bob's were very slightly oversized on the OD and mic'd out to give a good press fit and the gears were saved.